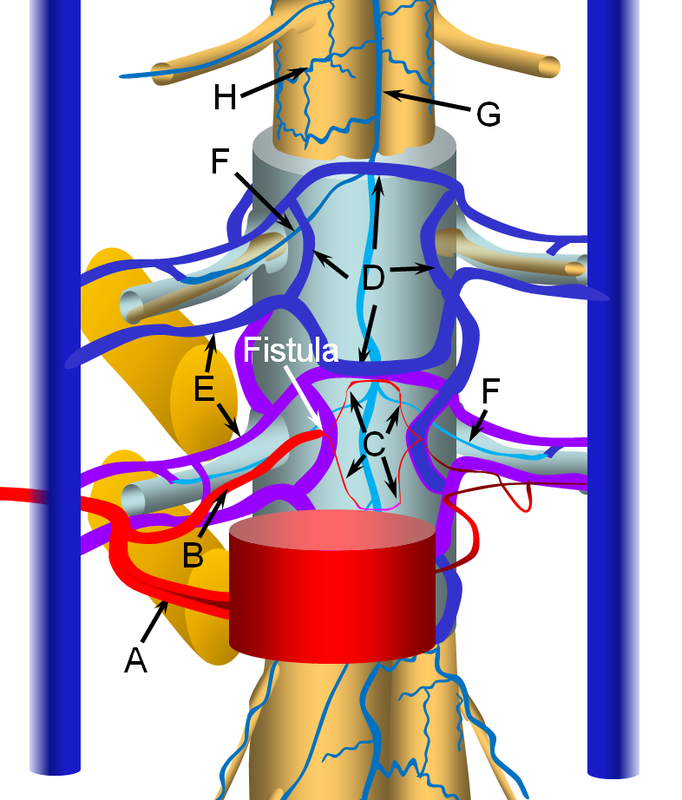 Spinal Epidural Fistula is a rare (or, more correctly, rarely diagnosed) fistula between the epidural arterial arcade (also known as the retrocorporeal arcade, since it is located behind the vertebral body) and the epidural venous plexus, as seen in the diagram below. Click on the following links to spinal arterial anatomy and spinal venous anatomy pages for details of normal anatomy. In the normal anatomy figure below, the aorta gives off paired segmental arteries (A), with a dorsal branch (B) penetrating the neural foramen to supply structures inside the spinal canal, such as the “epidural arterial arcade”, labeled “C”. These are normally seen as diamond-shaped vessels; they provide a robust anastomosis between left and right segmental arteries. On the venous side, the ventral epidural venous plexus “D” is extensively connected up and down along the spinal canal, and communicates via multiple foraminal arteries (E) with the paraspinal veins (large vertical blue syllinders). The spinal bridging veins “F” connect the intradural spinal surface veins (G, H) with the extradural veins of the epidural venous plexus and foraminal veins. The bridging veins are the critical conduit between intradural and extradural venous systems. 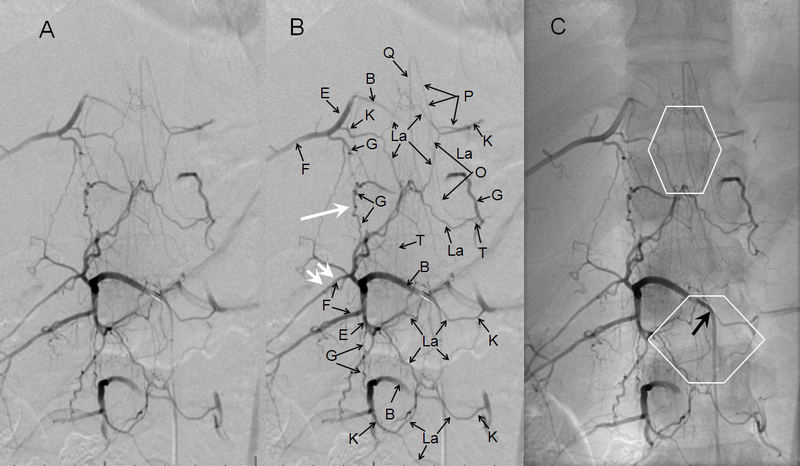 Below are images of normal epidural (retrocorporeal) arterial arcade in a young patient, demonstrating the extensive anastomotic potential of this network. The arcade is labeled “La” and also outlined by white diamonds. This image is part of the dedicated spinal arterial anatomy page. The fistula is most often located in the ventral epidural space, which tends to have a much richer vascular supply, as seen in the image below. The fistula forms between a ventral epidural arcade branch and the adjacent ventral epidural venous plexus. It is likely that many of these fistulas are asymptomatic, because of the many connections between components of the epidural plexus and with paraspinal veins outside the spinal canal via the foraminal veins (F). Thus, spine surface veins (G,H), remain unaffected despite their potential connection with the epidural plexus. The etiology (cause) of this fistula (and dural fistulas, pial fistulas, AVMs, aneurysms, and practically everything else neurovascular) is unknown. Anatomy, however, we do know, and as such is its extremely worthwhile to study it. The epidural venous plexus extends from foramen magnum to the sacrum, as a series of highly interconnected venous “lakes.” These connections are so extensive that the whole plexus can become part of an alternative conduit of venous blood from the lower extremities to the superior vena cava in cases of inferior vena cava obstruction — known as the “Batson’s venous plexus”. The epidural veins are only a part of the whole “Plexus” which also recruits paraspinal veins. In any case, the point is that epidural venous plexus is highly redundant craniocaudally. It is also extensively connected with paraspinal veins outside of the spinal canal via the foraminal veins — these extend across every foramen which is not stuffed, crushed, or otherwise obliterated by disks and osteophytes. These veins are well-seen with modern MRI imaging, especially on T2, as they are outlined by neural foraminal fat. Given this kind of venous redundancy, one would expect that an epidural fistula would be efficiently decompressed both via longitudinal connections of the epidural plexus and via foraminal veins, without causing any changes in the spinal veins. This may in fact be so in asymptomatic cases, as illustrated in the above image. We have seen these fistulas very occasionally on spinal angiography as incidental findings, and they do not congest the spinal veins. Sometimes, patients with extra-spinal AVMs (Parkes-Weber Syndrome, for example) have their AVM venous drainage conducted into the epidural venous plexus — again, this does not congest spinal veins, as a rule. Images of this situation are shown below. An AVM (red arrows) drains into a dilated ventral epidural venous pouch (pink arrows) at the L5 level; the pouch decompresses cranially into the L4 and L3 epidural plexus (blue arrows) and via multiple formainal veins (blue and purple arrows) into the paraspinal veins (yellow arrows). 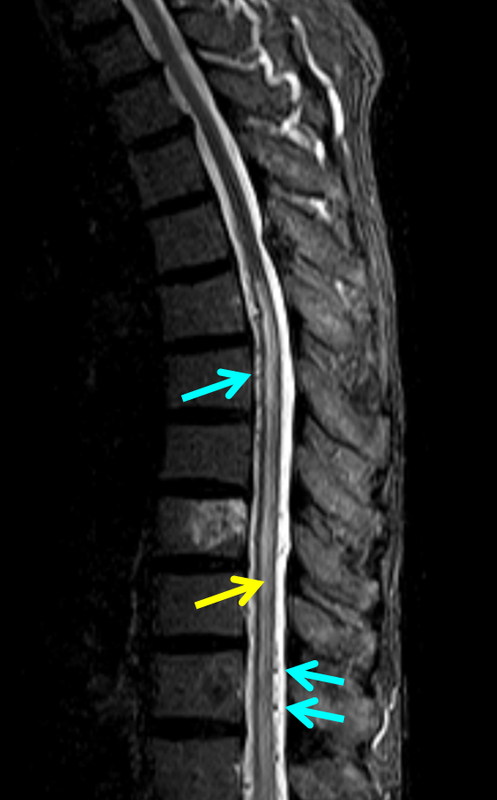 The image on the right shows bony landmarks with superimposed outlines of the pedicles (white ovals) and neural foramina (yellow). However, some epidural fistulas do become symptomatic by reflux of venous outflow into the spinal veins, as seen in the diagram below. Because the pathophysiology (cord venous congestion) is the same as for the spinal dural fistula, the clinical presentation is similar also — progressive myelopathy, bowel-bladder issues, sensory changes, etc. Hemorrhage has NEVER been described. For whatever unknown reason, some epidural fistulas either do not have sufficient venous outflow, or this outflow becomes occluded, as seen in the figure below. 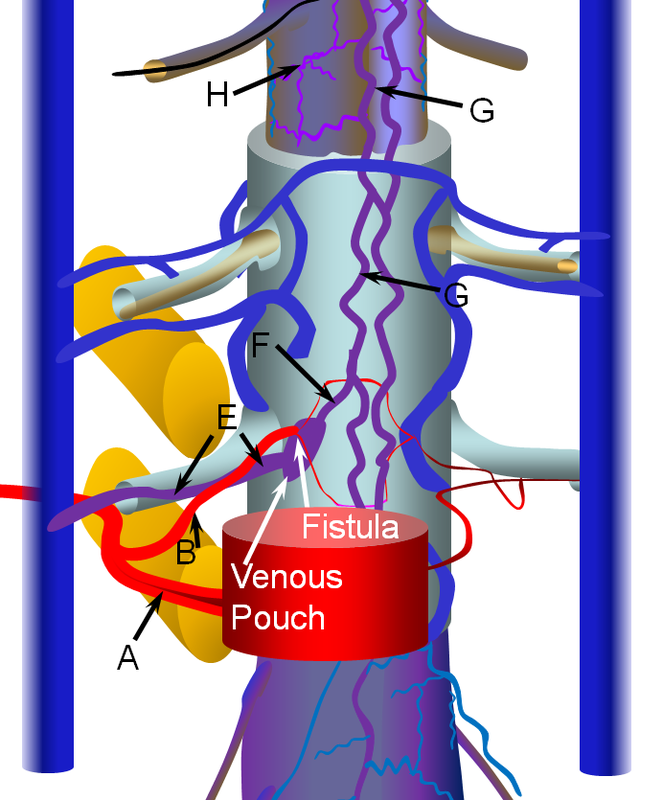 Here, the fistula opens into a “venous pouch”, which has insufficient outside connections via the formainal vein (E) for the degree of venous congestion. 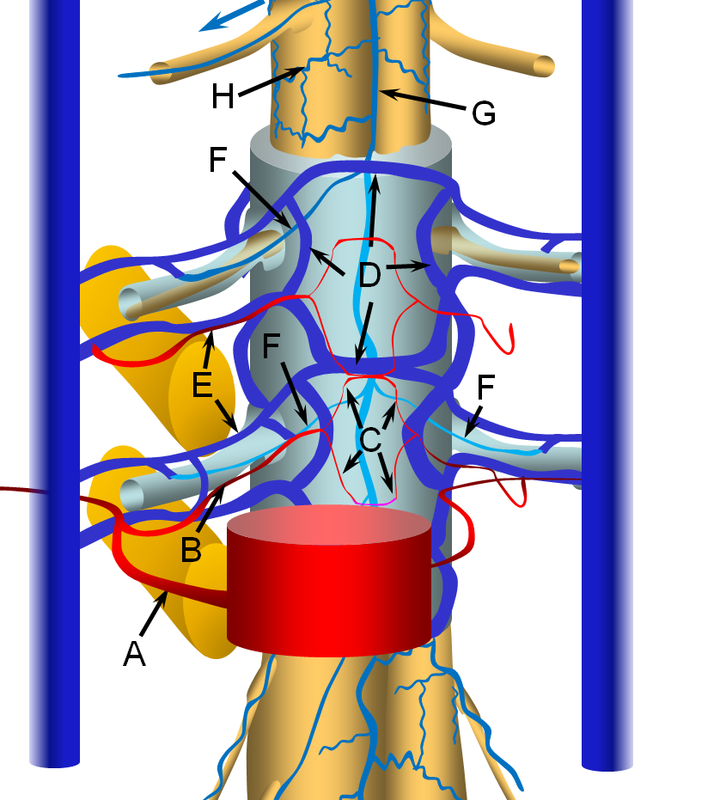 Because the epidural venous plexus is also connected to spinal veins (G) via the bridging vein (F), spinal congestion and its associated clinical sequela can follow. Mechanisms for this possible situation are, of course, unknown, but may be similar to those leading to occlusion of primary draining veins in other fistulas. For example, dural fistulas of the sigmoid sinus are well known cause occlusion of jugular bulb and transverse sinus, resulting in primary intracranial venous congestion and higher risk of hemorrhage — for discussion of grading, images, etc, see the appropriate Brain Dural Fistula page. Very occasionally, spinal epidural fistulas can hemorrhage, as described for example in this case report. Most epidural hematomas are probably spontaneous venous hemorrhages (anticoagulation is a risk factor, for sure), however since spinal angiography is rarely performed for the epidural hematoma, the true incidence of fistula or AVM in these cases is unknown. Whatever the case, the spinal epidural veins are of course connected with spinal bridging veins, so that an epidural fistula which has no other way to drain will end up decompressing in retrograde fashion into the spinal veins. This, again, sets up the same pathophysiology of spinal venous congestion as the much more common Spinal Dural Fistula. The hallmark of an epidural fistula (besides the fact that the feeding artery is not the radicular artery) is presence of a dilated epidural venous “pouch” into which this fistula primarily empties. From this pouch, the spinal veins are secondarily opacified. It is helpful to recognize this pattern to make a diagnosis of the “epidural” type of fistula. This pouch is usually seen on MRI, at least retrospectively, and may actually be a neat prospective finding to clue the neurointerventionalist into the possibility of this particular kind of fistula, and also to identify its level. The goal of endovascular treatment is to close the actual fistula hole, same as for any other fistula. This is best done with nBCA. Onyx, in my opinion, is not a reliable method to attack these fistulas. Operators who are not familiar with nBCA are probably best off using the tool they know, but I don’t think it works as well. Because the fistula usually opens into an epidural venous pouch before emptying into the bridging and spinal veins, there is a lot of “safety” present. The whole pouch is “safety” and may be filled with nBCA to your hearts’ content. Even if the entire pouch cannot be filled, the glue will usually set the part of it close to the fistula, which will be enough occlude the fistula as well. Of course, the closer one gets the microcatheter to the fistula, the more chance the glue will “reach” the target. It is rather important to carefully get yourself in position for the glue shot, because surgical options are not that great — it is not so easy to get to the ventral epidural venous space, and there is no way to obtain the kind of “exposure” typically possible with dural fistulas. The surgeon will reach the epidural space only to find that it is profusely bleeding; probably obliterating the bleeding venous plexus at the level of the fistula by stuffing it with blood-stopping stuff will be enough to close the shunt, but it is likely to be a rather messy affair. I am not aware of such a surgery ever been performed, so please write me if you have done or seen one, and supply the pictures so we can update the site. 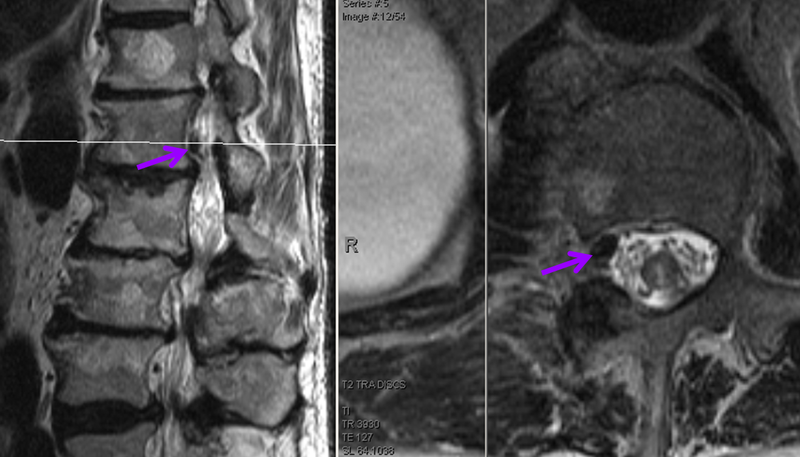 At L1 level, a T2 void (purple), corresponding to the epidural venous pouch. Injection of the right L1 segmental artery (red) demonstrates hypertrophy of the epidural arterial arcade branch (orange), opacifying the same venous pouch (purple) seen on the MRI. The pouch opens into a foraminal vein (white arrow) and into the L2 level epidural venous plexus (green arrow). 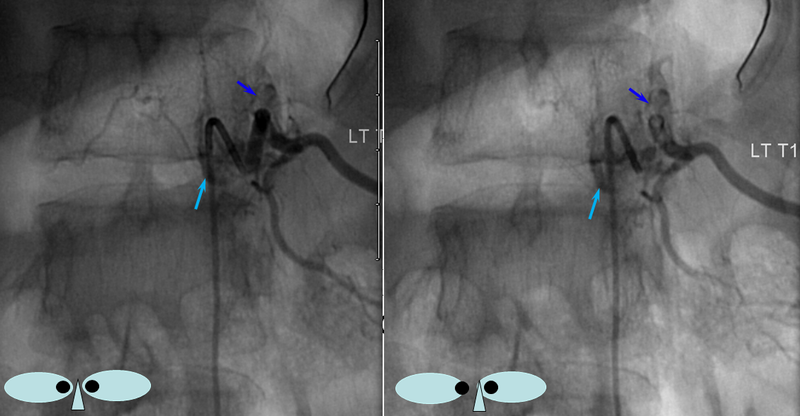 However, these outlets appear to be insufficient, and late arterial phase images also show retrograde congestion of the spinal veins (light blue) via the bridging (radicular) vein (black). A composite view of delayed venous phase images of the spinal veins, demonstrating tremendous venous congestion (light blue arrows) with no outflow into any bridging (radicular) veins at thoracic or cervical levels. All of these veins are gone. The spinal veins eventually decompress via the superior petrosal sinus (brown) into the left jugular vein (dark blue). Given the extent of spinal T2 signal change, this is not surprising. Microcatheter injections of the feeding pedicle, with catheter tip in the epidural arterial arcade branch, at the point of the brown arrow. The catheter is sufficiently close to the fistula, demonstrating again the venous pouch and its outflow. 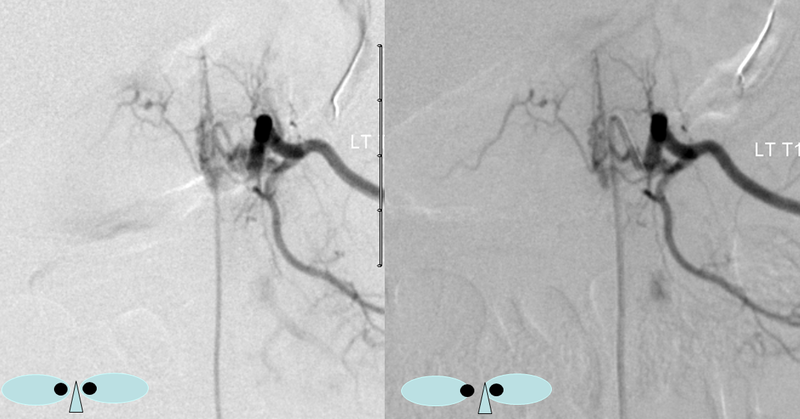 Image on the right is an nBCA glue cast, with complete fistula occlusion documented by injection of contralateral (left L1) segmental artery, and right T12 and L2 segmental arteries (not shown). Once closed, clinical recovery, as usual, depends on the severity and duration of pre-existing symptoms. As in the case of dural fistula, there is a possibility that massively dilated spinal veins will thrombose once the fistula is closed — the physiologic amounts flow in spinal veins are orders of magnitude lower than is the case when these veins are dilated by fistulous inflow. Thrombosis of these veins is very bad news indeed — the cord needs them for drainage. The result of thrombosis is venous hypertension and acute clinical deterioration, usually to compete paralysis. The typical story is a patient who emerges from embolization at pre-procedural baseline, and is noted to acutely deteriorate on day 0 or 1 post-procedure. Treatment is emergent, aggressive heparinization and anti-coagulation, with variable outcome. In a way, this kind thrombosis is similar to consequences of early surgical attempts at fistula treatment by stripping spinal veins. For this reason, we have a very low threshold for prophylactically starting patients on heparin in the post-procedural period, and sometimes longer with dealer’s choice of anticoagulation. The relationship of the vascular to bony landmarks is appreciated on these stereoscopic native views. Notice how the paravertebral vein (dark blue) projects just outside the pedicle. The foraminal vein is superimposed on the segmental artery). I think these benign fistulas tend to be overlooked, as the appearance is not very impressive, and separation between arterial and venous phases is frequently not pursued to the same extent on spinal angio as it might be in the brain. Since there is no drainage into intradural spinal veins, there the situation is likely to remain benign. There is also a review/classification article by Spetzler et al, which lists some references.